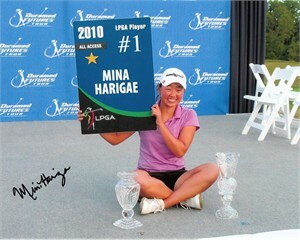 8x10 photo of Mina Harigae celebrating her gaining 2010 LPGA Tour membership as the 2009 Futures Tour leading money winner, autographed in black marker. With certificate of authenticity from AutographsForSale.com. ONLY ONE AVAILABLE FOR SALE.